Cowdenbeath FC is pleased to announce an expansion to its Community Football Programme. In addition to the highly popular Schools Programme and Holiday Camps, the Club has teamed up with the SFA and Fife Leisure and Sports Trust to deliver Walking Football for the over 50s and Mini Kickers for 3-5 year olds. Sessions will be overseen by Dean Ewing, our UEFA B Licence Holder Football Development Officer supported by SFA Coaches. All Coaches are fully trained to deliver these programmes, are First Aid Trained and have the required PVG Certificates relative to child protection requirements. Walking Football has become increasingly popular. It’s exactly what it sounds like – a standard game of football where players walk instead of run. 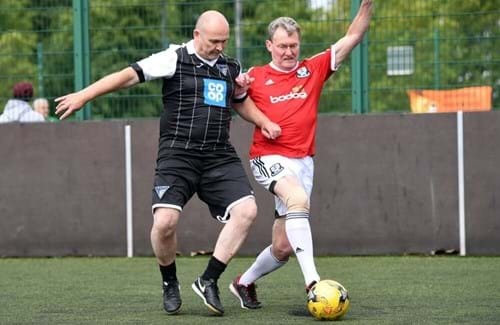 It's designed to help men and women over 50 get fit or maintain an active lifestyle, as well as support people getting back into football if they have given it up due to age or injury. Older people who play have seen many benefits: lower heart rate and blood pressure, less fat and more muscle, and better mobility. And it’s not just health benefits - walking football also offers social benefits. Participants can meet new people, avoid becoming isolated, and interact with individuals and small groups. This is one sporting activity that is suitable for all. Walking Football starts on Thursday 1st Nov 10-11am on the Cowdenbeath Leisure Centre Astro. Initial sessions are FREE sample sessions and includes Tea, Coffee & Biscuits in the lounge at Central Park after the game. Mini-Kickers classes are fun participation sessions that provide the ideal first step on a young person’s Football for Life journey. Boys and Girls aged 3-5 can take part in a wide range of activities designed to improve their physical literacy; running, jumping, hopping, skipping, balancing, rolling, bouncing, climbing, throwing, catching and of course, kicking are all developed. Using imagination and creativity, the children play their way through many different themed sessions; animals, countries, pirates, colours and numbers are among the enjoyable topics introduced to allowing for a holistic educational experience. Music, balloon play and obstacle courses also ensure every session is great fun. Mini Kickers classes will start on week beginning 5th Nov in the Leisure Centre on Tuesdays 10-10.45am and Thursdays 1.30-2.15pm. Cost per 7 week block is session is £17.50. For more information or to book on any of the above classes, phone Cowdenbeath Leisure Centre on 01383 602305.